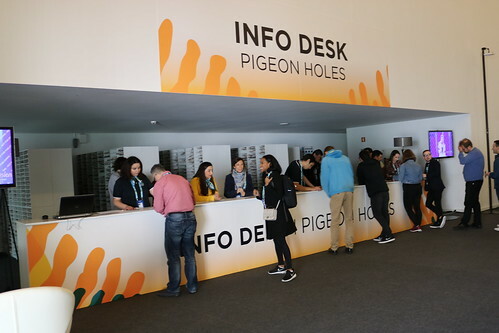 Eurovision Press Centre | ESCKAZ.com live from Lisbon! My name is Desiree, I'm from the Netherlands and very excited to finally be in Kyiv! It's my first year as part of the ESCKAZ team but not my first Eurovision. 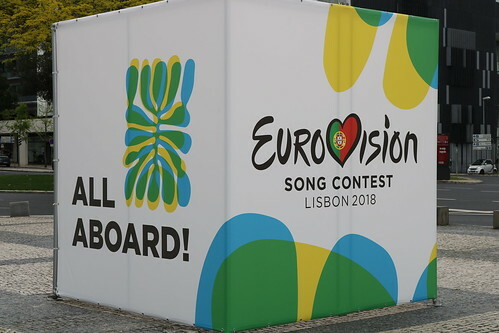 I went to Eurovision three times before in 2008, 2010 and 2012 - the full two weeks each of them with accreditation for another organisation. In 2011 Eurovision was quite close (in Düsseldorf) so I went to the second semi-final where I hoped to see 3JS pass to the final. Well that didn't quite work out... I also went to JESC 2007 and 2012 - both held in the Netherlands. All of them so far have been great experiences, no Eurovision is the same! After 2012 a lot has changed. From 2013 onwards press isn't allowed in the hall during the first rehearsal, so this time I will be spending a lot more time in the press centre, particularly in the first few days. However, whenever it is possible you will probably find me in the hall as I really love the 'live' experience. Compared to the other years I went to Eurovision I found the songs were often more diverse in style - and language. I'm absolutely not writing off any songs just because they are not in their own language, but I enjoy to hear songs in other languages a lot which is often reflected in my personal favourites as well. Switching to - most frequently - English usually also involves a change towards a more mainstream genre. For me it makes the contest a bit less interesting but luckily I still manage to find some favourites each year. This year is no exception. For example the Belarussian really stood out for me from the first time I heard it and I really enjoy France, Italy and Portugal - which is a grower. My personal top favourites are Ireland and Finland, in no particular order (as it changes every day). As for predictions - I'll get into that later! I'm writing this from my hotel room which is incredibly close to the IEC. I arrived earlier today after getting out of bed at not very funny hours. In fact I can even see the IEC from my hotel room as I'm on one of the top floors. Definitely a room with a view! Unlike Mike and Daniel told earlier, I had absolutely no problem at all to gather my accreditation. Hopefully the same goes for everyone else to arrive later on so that what was shown in the morning were just starting-up struggles..
Now it's time for me to find the rest of the team will check back later! Read more about Finally in Kyiv!